Snorlax. Sleeping. Pillows. It makes sense, doesn't it? That was likely the thought process behind this actual Snorlax pillow. As spotted by Tomopop, the Snorlax cushion has been recently put up for pre-order by ToysLogic, a US-based online toy shop. Manufactured by Banpresto, a Namco Bandai subsidiary which specializes in toys, the cushion weighs just over two pounds and stands at 34cm tall and 19 cm thick. As you can see, it is also cuddly as hell. It's a bit on the expensive side at forty bucks but, let's face it, comfort costs money. 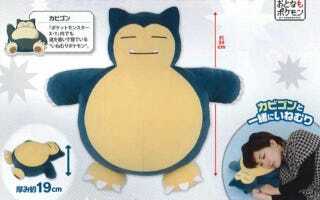 And this Snorlax plushie looks incredibly comfy.